Dr. Ellis Crasnow (center) with students on the first day of school. At STEM3 Academy, sticking to the norm doesn't work. "Our emphasis is on learning versus teaching," said Dr. Ellis Crasnow, the school's director. "Our students learn by doing, experiencing and constructing rather than just sitting in a classroom listening to a teacher." 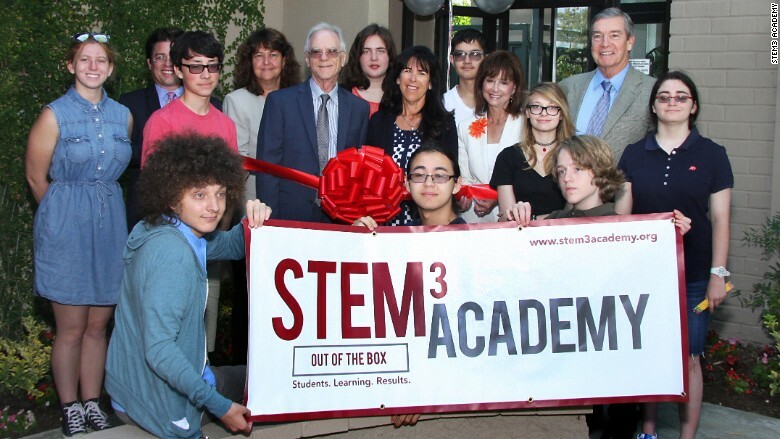 About 75% of the students at STEM3 are placed by a district program (which pays the tuition). Otherwise, tuition is $35,000. 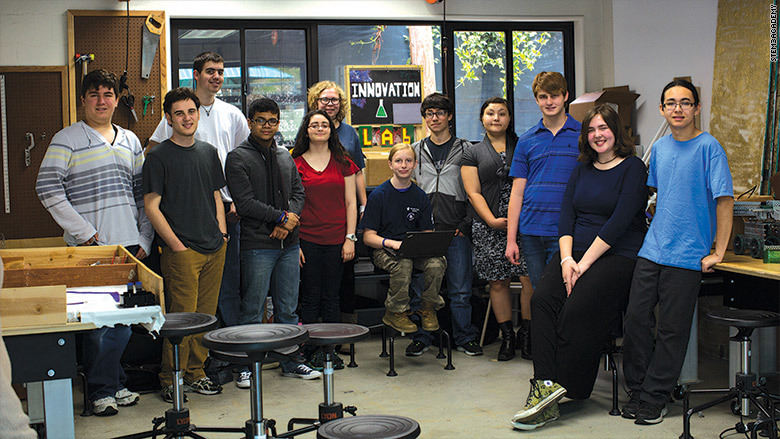 STEM3 Academy has an innovation lab that's equipped with a CNC machine, 3D printer, CAD machines and electronics. 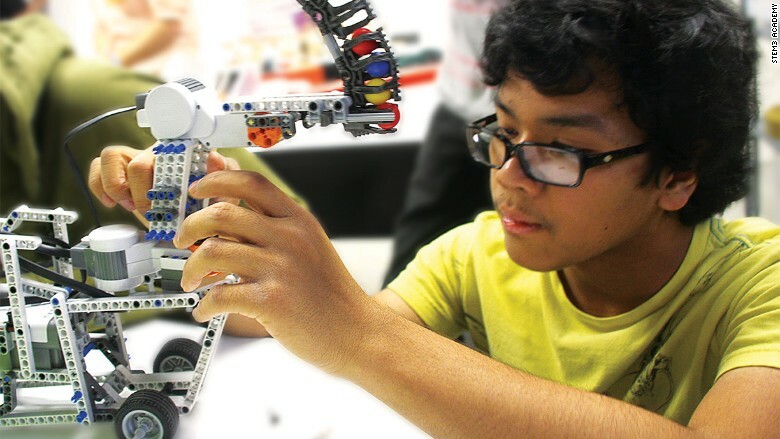 It also offers programs in robotics, entrepreneurship and programming. Much of the learning is based on group work to facilitate social interaction (the students sit at large communal tables). "The statistics are telling," said Crasnow. "We know that 34% of students with these learning challenges that go on to college chose STEM majors." Some large companies -- including defense contractor Raytheon (RTN) and aerospace and defense technology company Northrop Grumman (NOC) -- have already approached the school about potentially working with the students. Terry Whiteside's son Cullen is a junior at the STEM3. He was previously in two other schools in The Help Group's network. Whiteside said Cullen, who has autism, is gifted in math and programming, but struggled socially before coming to STEM3. STEM3 Academy students in the Innovation Lab. "It's been a big change," she said. "Before he wouldn't talk much about his day. Now he comes home and has conversations with me about what he did at school." She compared this to his performance growing up -- his standardized test results were poor, even though she knew how bright he was. "What's so amazing to us as parents is how far Cullen has grown since we started the educational journey," she said, adding that he tested in the 99th percentile of the PSAT and has had interest from several top-rate colleges. Cullen symbolizes what STEM3 Academy is trying to achieve. "The stats regarding the post high school success of students with special needs is very poor. 80% to 90% of them are unemployed or underemployed," said Crasnow. "These are horrific numbers and our goal is to change them." Crasnow said STEM3 Academy will become a K-12 school by the end of the year. "We want our students to be able to stand side by side with their typical peers after they graduate," he said.